Cosmic Rays Sound Scary, But Radiation Risk On A Flight Is Small : Shots - Health News Pilots and flight attendants in some countries are classified as "radiation workers" because of their extra exposure to cosmic rays. Scientists say these frequent fliers may face greater risks. If you take a Geiger counter with you on your next flight, you'll notice the dial ratchet up as the plane approaches cruising altitude. Every time you fly, you get zapped by a little extra radiation from space. It goes right through you, in teensy amounts. It's usually nothing to worry about, even if you're pregnant. But for people who fly a lot — like the plane's crew — that sort of exposure might, in rare instances, amount to something. Research published Wednesday in JAMA Dermatology shows that pilots and other air crew members have "approximately twice the incidence of melanoma compared to the general population." The study's authors say that difference might be partially due to in-flight exposure to UV and cosmic radiation. The National Institute for Occupational Safety and Health is using computer models to look into how working as a flight attendant might affect reproductive health. 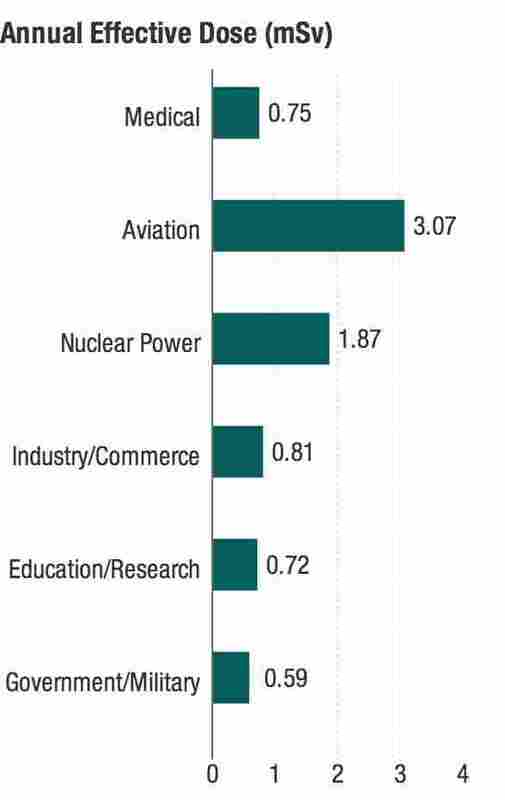 A recent study in the journal Aviation, Space, and Environmental Medicine looked at data from 2 million flights and found that some flight attendants may exceed recommended radiation limits. "This would be uncommon, but it does happen," says Jeri Anderson, a health physicist with NIOSH and lead author of the study. "It could be at a level that could be of concern, and in excess of the national recommended dose for a pregnant woman." In some countries, including the United States, members of a flight crew are considered "radiation workers." According to NASA researchers, a pilot who routinely works long-haul flights may be exposed to about twice the radiation of the average landlubber and more than a fuel-cycle worker in a nuclear power plant. "Galactic cosmic rays" may sound like beams from an alien weapon, but they're actually the charged particles emitted by stars, including our sun. In an instrument called a cloud chamber, they look like gentle wisps. When accompanied by violinists, they sound like buzzing flies. The rays pass through us all, "whizzing through you every day of your life," delivering a smidgen of radiation, says radiation physicist Robert Barish, who wrote a book about in-flight radiation. On a long-haul flight, particularly at high latitudes, that smidgen can become a dollop. There are a few reasons for that. At a passenger jet's cruising altitude — 30,000 feet or more above the ground — the protective layer of atmosphere that surrounds the Earth and deflects cosmic rays isn't as dense. 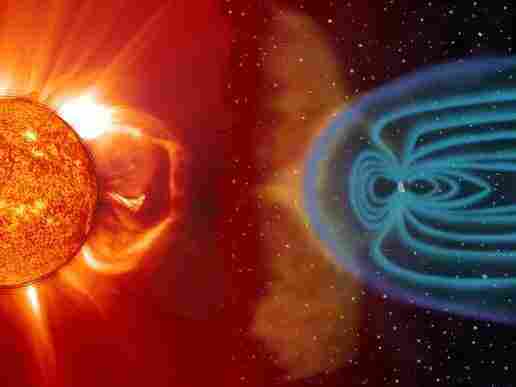 The Earth's magnetic shielding is also weaker over the poles, which means that more radiation enters at high latitudes. And the sun sometimes lets loose with space weather, delivering 100 times more radiation than usual. Airlines in European Union countries train and monitor their employees as if they were working directly with radioactive materials. Elsewhere, Canada and Japan have issued similar recommendations. U.S. airlines tend to be less prescriptive, though the Federal Aviation Administration has published guidelines to advise them. The possible health ramifications for flight crews are still under study. NASA is developing a space weather monitoring system that might be used to give airlines a heads up when rays are likely to be particularly intense. The International Commission on Radiological Protection is working on a report on the subject. And an upcoming NIOSH study will look at the possible impact of flight on the risk of miscarriage. Evidence that solar radiation has any effect on fetuses is scanty, researchers say. "The science says that the fetus is particularly sensitive between the eighth and 15th week," says Jacques Lochard, leader on the upcoming ICRP report. "This is the sensitive period [for] IQ loss." But most of that information is based on cases of extreme exposure, he says, such as the children of atomic bomb survivors, who would have received a different kind of radiation, and in doses much higher than those experienced on a plane flight. Radiation is only one part of why European airlines encourage female staff to declare their pregnancy as soon as possible. Jet lag, for example, which entails a disruption of circadian rhythms, might also affect reproductive health. Even if the risk from occupational exposure to cosmic radiation is small, airlines should routinely provide information that would enable flight crew members to figure out their lifetime exposure, as "a matter of respect," Lochard says. Judith Murawski, an industrial hygienist with the Association of Flight Attendants, agrees. "Would it be justified to not mention to nuclear workers that they're being exposed to radiation?" she asks. "It's the same." There isn't much crews or passengers can do about their exposure, short of avoiding polar flights, or taking a boat instead. Flying airlines at low altitudes would burn more fuel, and it wouldn't make sense to encase jets in heavy protective material. But commercial airlines can heed warnings about unusual space weather so they can change flight paths. And pregnant air crew can choose flight routes that travel at lower altitude and latitude. Anyone can estimate their own exposure with various online calculators, or check out space weather conditions, as Murawski did when she was pregnant. "Had there been a solar storm of S2 or higher, then I would not have flown," she says. Of course, many travelers don't have that level of flexibility or concern. Barbara Grajewski, an epidemiologist with NIOSH, says at the end of the day it's about probability. "The more you're exposed, the higher the probability" that you've somewhat increased your risk of something like cancer or prenatal defects. That may sound scary. But this chart, from the blog Information is Beautiful, helps put things in perspective. As the diagram makes clear, walking through an airport security scanner exposes a person to about the same ionizing radiation dose as eating a banana. Flying from New York to Los Angeles exposes you to roughly the same amount of radiation you'd get from eight dental X-rays — and less than you'd get living in a stone house for a year. And those peanuts that airlines hand out? They're a little radioactive, too. An earlier version of this story misattributed a quote about the risk to pregnant women from cosmic ray exposure. Jeri Anderson, a researcher at the National Institute of Occupational Health and Safety, made the comment about uncommon exposures exceeding recommendations, not her colleague Barbara Grajewski.